I can’t overstate the effect of Trump's new tariffs, 25% on steel and 10% on aluminum. (As we reported Sunday, he upped the recommended 24% on steel to 25% because it's a nice round number). Why it matters: These tariffs have the potential to roil markets and affect relationships with allies. Trump is also touching the third rail of international trade law — he’s using an arcane trade law known as Section 232 to justify his actions. He’s saying “F You” to the World Trade Organization and arguing the global overproduction of steel and aluminum constitutes a national security threat to the U.S. 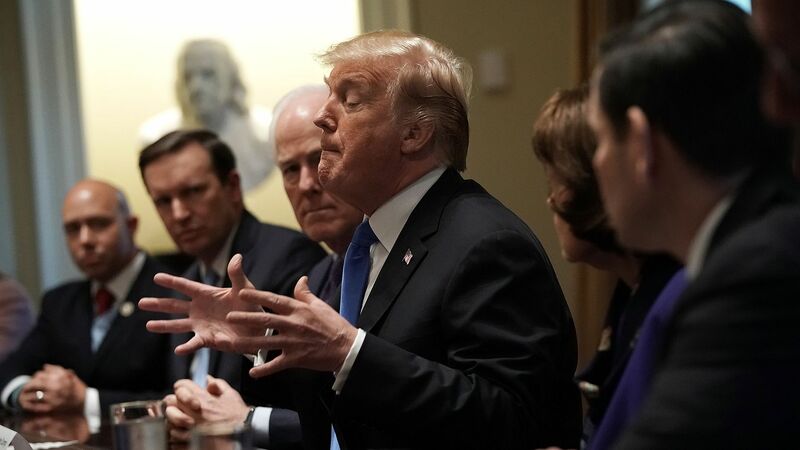 He's also breaking with Capitol Hill and top officials — including Gary Cohn, James Mattis, Steven Mnuchin and Rex Tillerson — who have been arguing strenuously against these tariffs. Mattis says they will be a national security problem if they’re broad-based and don’t allow allies off the hook. And one other thing — the loss of staff secretary Rob Porter contributed to the chaos here. Porter controlled the paper flow and oversaw the weekly trade meetings in the Roosevelt Room. What happened over the past 24 hours was a complete breakdown in White House process. Well, it’s March 2018, and Trump hasn’t changed his views one iota. He wants his tariffs and darn it, he’ll have them. The only two senior officials telling Trump this is a good idea are Wilbur Ross and Peter Navarro. Watch for huge fallout: Will Gary Cohn and other free-traders stay after this? Trump just completely circumvented the interagency process and is executing a policy Cohn and others think is calamitous. Perhaps the thing that will most unsettle Trump is the markets falling after his announcement. Cohn and Mnuchin had been using Trump’s love of his record-setting stock market as a way to convince him not to take any dramatic trade actions. Over the course of a year Trump watched his top officials — the free-traders versus the protectionists — duke it out in front of him, in meetings that sometimes descended into officials flat out insulting each other. These fights have happened in the Oval and more recently in the Situation Room. The tariffs could rebound on Trump by increasing the the price that consumers pay for cars and trucks, canned drinks, aluminum foil and more. The Pentagon will pay more to make fighter jets. Trump believes to his core that foreign countries are taking advantage of America and that America needs to fight back with tariffs. He also believes that he can oversee a renaissance of steel production in the United States. He foresees a return to the Rust Belt smokestacks and the high-paying steel manufacturing jobs of yesteryear. Some of his staff have been telling him those days are over, and a number of senior officials criticized Wilbur Ross’ report that underpinned this decision. Some officials, including Cohn, told colleagues the report was “terrible” because it didn’t properly analyze the jobs that would be lost downstream in industries like the automotive sector that rely on steel and aluminum to make their products.